"Love his passion. Entertaining style." "Probably the best presentation I attended while at the forum. Davis Balestracci was entertaining, very informative, and very refreshing in his attitude towards our current trend of overwhelming ourselves with redundant or meaningless data." "Very down to earth and put at a level that anyone could understand. An excellent presentation." "Great use of humor and hands on learning. Would go to his presentation again. Thank you for giving me such simple, valuable information. Where were you when I started in this business 6 years ago?" "Just not enough time to absorb all the wonderful information Mr. Balestracci had to present." I work with a wide variety of clients who are interested in a holistic approach to improvement: building a system that can successfully create and sustain significant improvements of any type, in any culture, and for any business. This could include: quality improvement specialists; medical directors who feel “stuck in the middle” between executive and front-line issues; people seeking mentoring on quality improvement as a serious career path; and executives who would like to explore quality improvement as THE strategy for achieving strategic goals. I especially enjoy working with service industries – health care, education, government – where formal application of quality principles is relatively new. 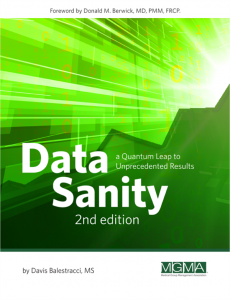 For the last 20 years, the bulk of my work has been in healthcare, which formed the basis for my book Data Sanity: A Quantum Leap to Unprecedented Results. Know that the answers themselves aren’t simple, but are based in a simple concept: it’s all about reducing variation. Your quality education seminars are well-received, but people don’t change their everyday behaviors. What about all this money and employee time invested in training—where’s the promised payback? People in health care, as you present data to physicians, the response is “This isn’t in line with double-blinded, clinical trial analysis” and you’re not sure how to respond. Deep down, you KNOW that you could be contributing so much more to helping your organization obtain unprecedented results, but no one else seems to think so…or are unaware of the power of a holistic quality mindset How do we develop this kind of expertise internally?